There are many models for doing superb work. Here is one that can be used to achieve positive results. 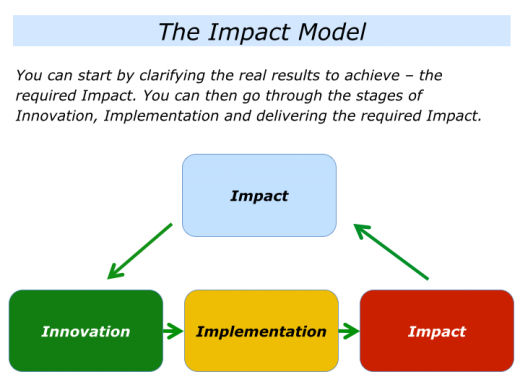 The model starts by clarifying the desired impact – the real results to achieve. It then invites people to go through stages of innovation, implementation and checking they have achieved the required impact. The model can be used by individuals, teams and organisations. But here we will focus on how it can be used by teams. Let’s explore how it works in action. Imagine that your team is working on doing a specific project for a customer. 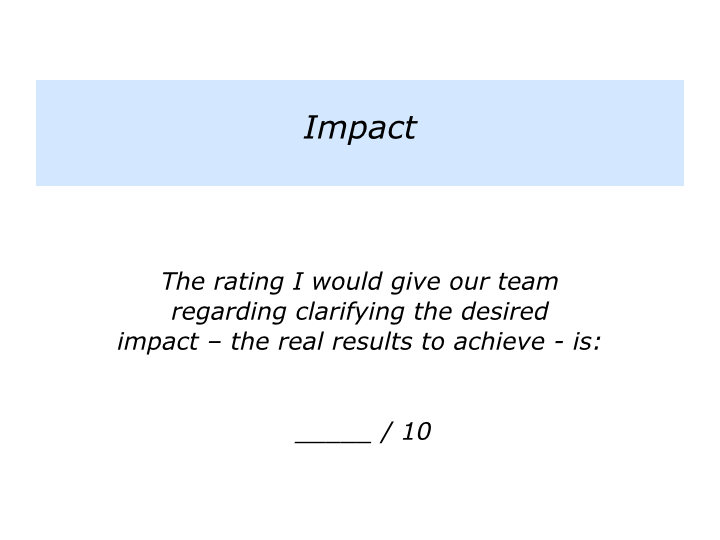 On a scale 0 – 10, how good is your team at clarifying the desired impact? One leader explained their team’s approach to establishing clarity. “Our team is relatively good at clarifying a customer’s brief and playing this back to them. “We could probably use our expertise more, however, to focus on the real ‘What’ – the real results to achieve. “The customer is often already onto the ‘How’ and this is what they want us to deliver. “Our best work comes when we are able to reassure the customer we can fulfil their agenda. But then we focus on the following areas. “We clarify the real results they want to achieve and show we understand their picture of success. “Sometimes we use our expertise to stretch their thinking by showing what it is possible to achieve. “After a while we agree on the ‘What’. We then also clarify the ‘Why’. These are the benefits of achieving the goals. “We reassure the customer that we can deliver the results. At the same time, however, we sometimes outline the various options for achieving the goals. “Whilst we will definitely make a recommendation, it can be useful to give the customer an overview of the potential routes forward. “They can then see the various options, together with the pluses and minuses of each route. “Sometimes the client may say they want a bit of each option. That is okay, but there may be funding implications. “Sometimes we go back to the real results to achieve and come up with extremely creative solutions. “It is then time to make clear working contracts and deliver concrete results. The specific results to be delivered and by when. The specific responsibilities – such as our role and the customer’s role in delivering the results. The specific things we will do to keep the customer informed on the road to achieving the results. “We conclude the meeting by playing back what has been agreed. “Returning to the office, we write up the agreement and send it to the customer. Adding that little bit extra, we always include a note about how we will get some early wins. “Confirmation often follows and we deliver some quick successes. “Clarifying the desired impact is crucial. If the project gets stuck, we go back to refocusing on the ‘What’, the real results to achieve. The leader gave their team an average of 8/10 in terms of establishing the required impact. When doing their best work, however, it was 10/10. How would you rate your own team? Describe the extent to which your team is good at establishing the desired impact – the real results to achieve – when working with a client. Rate this on a scale 0-10. It’s now time to move onto innovation. How good is your team at finding imaginative and innovative ways to reach a goal? Some teams are strong at clarifying the impact and being innovative. They may be less good at implementation, however, which they may find boring. This can have an effect on the money they earn – because a lot is earned through implementation – and the impact that is actually delivered. To add more creative thinking to clarify the real results to achieve at the impact stage. To develop more solutions at the innovation stage. Let’s assume your team has agreed with a customer on the desired impact. 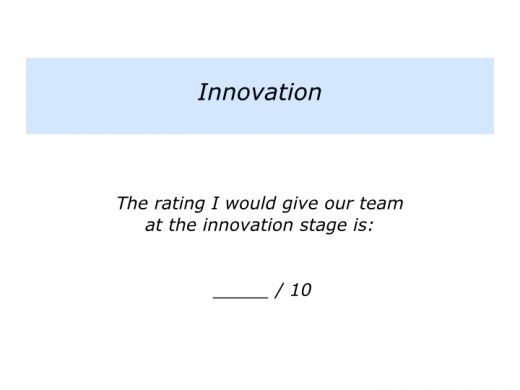 It’s time to consider your team’s innovation. 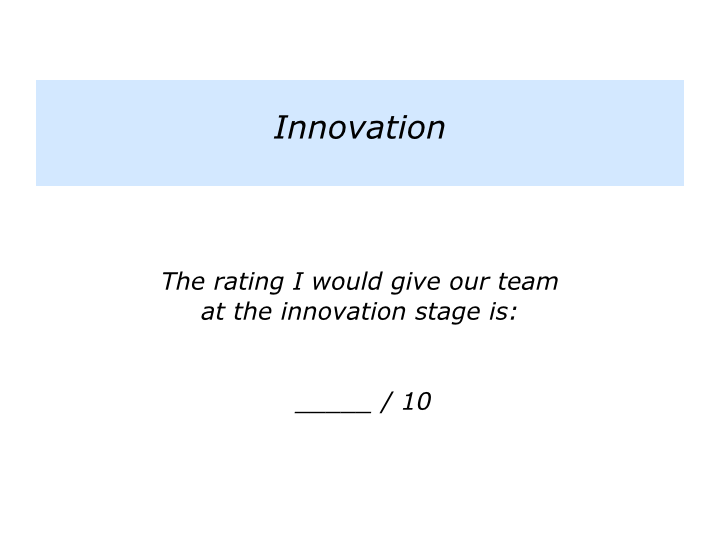 Describe the extent to which your team is good at the innovation stage. Rate this on a scale 0-10. Let’s assume your team and the customer are crystal clear on: a) The specific results to achieve; b) The specific strategies for achieving these results. 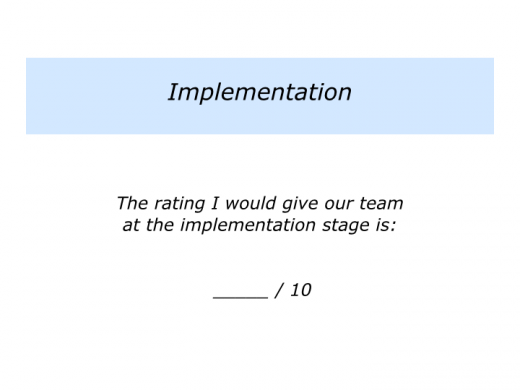 How good is your team at implementation? Some teams are superb at implementing the agreed strategies. They do the right things in the right way every day to achieve the right results. They make sure the engine always runs properly. Such teams are made up of great parachute packers. If people say they will do something, they keep their promises. The parachute will work properly and open on time. Such teams are also proactive. They continually focus on issues that are in the Green, Amber and Red Zones. 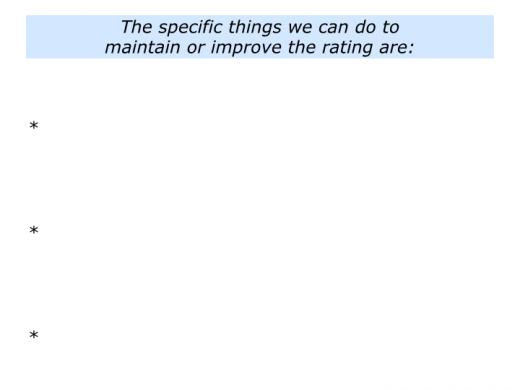 They clarify what is going well and focus on how they can keep improving. This is especially so with customers with whom they have good relationships. Instead of waiting for things to go wrong, they stay close to such customers and often get more business. They clarify where there are warning signs. They immediately fix these issues and aim to move things into the Green Zone. They continually anticipate events and aim to keep issues out of the Red Zone. If they have internal team problems that cause things to slip into this zone, they fix these as quickly as possible. Some customer relationships, however, may continually be in the Red Zone. If so, the team clarifies the reasons for this state. It may be, for example, that their own team must fix its issues and do so quickly. On the other hand, some relationships may be in the Red Zone because the customer is disorganised, uncommitted or whatever. If the latter is the case, the team must decide whether they want to continue the customer relationship. If so, they do what they can to control the controllables. But sometimes it can be more appropriate to look for other customers. Describe the extent to which your team is good at the implementation stage. Rate this on a scale 0-10. 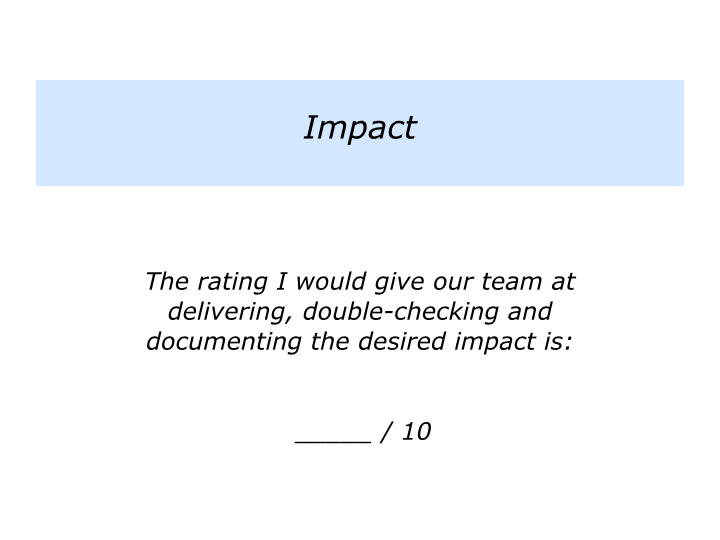 How good is your team at delivering, double-checking and documenting that it has achieved the agreed desired impact? There is a reason for this question covering three aspects. People can ensure they deliver the required results. The team must obviously fulfil it agreed contracts and deliver the goods. People can double-check the customer is happy with the results. This is crucial. Some customers may move the goal posts or change their agenda during the implementation stage. Evolution is a fact of life. So it important to stay close to the customer to continually focus on the agreed or evolving picture of success. Then, at the end, they can double-check the customer is happy with the delivered results. People can document the results. Some teams neglect this aspect. Other teams write success stories – or use other vehicles – to share the impact. This can lead to even more work. Success stories are crucial, providing they are written in the right way. If the customer is willing to be named, it is good to put them at the centre of the story. A series of such customer focused stories can build credibility. After all, you are in the business of helping the customers to achieve success. Great teams build on their strengths and manage the consequences of their weaknesses. They apply this approach to the Impact Model. Such teams clarify how they can establish the required impact. They then keep developing in the areas of innovation, implementation and delivering the required impact. This provides the platform for achieving ongoing success. 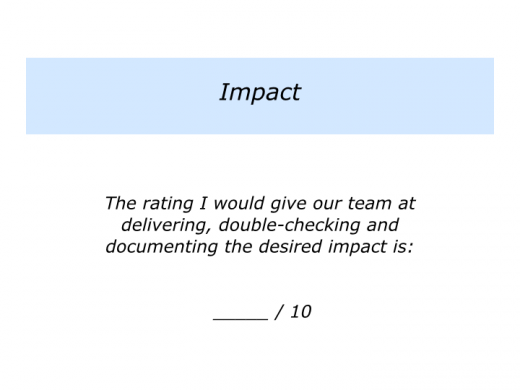 Describe the extent to which your team is good at delivering, double-checking and documenting the desired impact. Rate this on a scale 0-10.